We wanted to be able to converse with random people who have the same hobbies as us. By inputting your username and hobby, HobbyChat will connect you with another user. 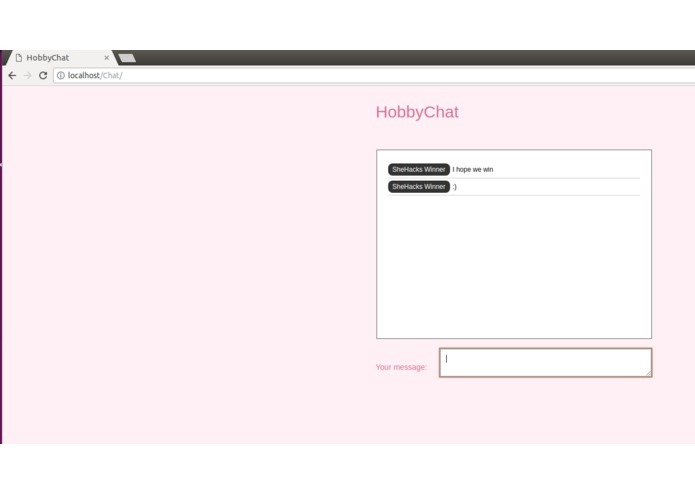 We built HobbyChat using PHP, AJAX, HTML, and CSS. We were unable to get the window prompt values to show up in the specified html fields. We're happy to be able to show a deliverable at the end. We learned that Hackathons are stressful but fun! HobbyChat needs to be developed more to customize the user experience with emojis.